No Lawyers - Only Guns and Money: Proud To Be A "Gundamentalist"
I learned a new word today - gundamentalist. From what I can tell from the Reuters' story, it means those of us who want the NRA to fight harder and compromise less. If that is the case, then I'm a proud gundamentalist. The Reuters story in question is about the effort to get Adam Kraut elected to the NRA Board of Directors and the efforts of those for and against Adam. You may remember that I both solicited petition signatures and endorsed Adam for the Board. As to why this story is being published months after the NRA Annual Meeting in Dallas is anybody's guess. Its rise has rattled the NRA leadership and threatens the association’s ability to hold on to moderate supporters and to make compromises that might help fend off tougher gun control measures, according to some of the two dozen gun-rights activists, policy experts and gun-control advocates interviewed for this story. The article does make mention of the attack on Adam by Marion Hammer and the unofficial but really official backing of an alternative candidate for 76th director. The article is worth reading and is generally accurate. According to a post by Adam on Facebook he was interviewed multiple times for the article. He has also started receiving hate mail from barely literate anti-gunners. I will conclude by saying that if Adam Kraut decides to subject himself to the board election process again he has my full support. 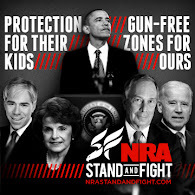 The NRA leadership are swamp people but they are our swamp people. I wish we didn't need them but we do. The right to bear arms would have been extinguished decades ago without them. So I grit my teeth sometimes and go on supporting them. Smaller, more radical groups are not any where near as effective but they do serve to hold the NRA's feet to the fire. Gundamentalist... new one on me but I like it!